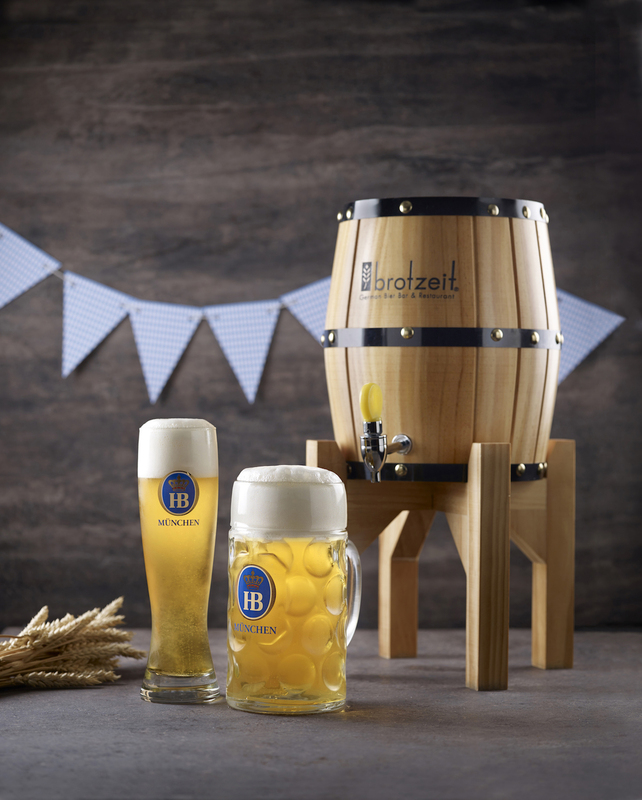 German beer bar and restaurant chain Brotzeit kicks off Oktoberfest in Singapore with an entire slew of seasonal goodies – including Oktoberfest bier – that promises to be a Bavarian feast of epic proportions. It’s hard for Brotzeit to beat what it did last year for Oktoberfest when it commemorated its 10th anniversary, but that won’t be stopping the German themed restaurant chain. It kickstarted its Oktoberfest celebrations on 13 September 2018 with the launch of this season’s Oktoberfestbier from Hofbräu made available at all its outlets across Singapore. So here’s a little bit of beer trivia for those who aren’t too familiar with beers served at Oktoberfest. Traditionally, only beer conforming to strict guidelines – brewed to the German Reinheitsgebot purity law (which states only water, barley, and hops can be used to make the beer), and made within Munich’s city limits – can be called an Oktoberfestbier and served at the original Oktoberfest celebrations in Munich. In fact, only six breweries – aside from Hofbräu, there’s Augustiner, Hacker-Pschorr, Löwenbräu, Paulaner, and Spaten – are allowed to make Oktoberfest beer… and not too much of it get exported overseas. That’s right – this means that many of the German beers served in Oktoberfest festivities across the world aren’t actually right proper Oktoberfest bier. Curiously too, the official beer style designated for Oktoberfest is the Märzen – so called because it’s traditionally brewed in March – which is brewed with more hops and comes at a higher alcohol content of around 6% ABV. More importantly though, the Märzen is technically a lager and not an ale; if you’re drinking German wheat beer – which is made with ale yeast – at an Oktoberfest party anywhere in the world it’s a dead giveaway that you’re technically not getting the proper Oktoberfest experience. We went through all that to tell you that the Hofbräu Oktoberfestbier (from $16++), exclusively available at Brotzeit, is the real deal if you want an authentic Oktoberfest bier. To complete the authentic Bavarian Oktoberfest experience, be sure to partake in the seasonal dishes offered by Brotzeit. We’re particularly fond of the Oktoberfestplatte (S$138++), a massive platter bursting at the seams with crisp oven-roasted pork knuckle, juicy beer-infused Bavarian honey ribs, a succulent whole roasted chicken and a flavourful one meter smoked pork sausage that can feed 5 or 6. Similarly decadent is the Gefüllter Schweinebauch mit Soβe (S$69++), or stuffed pork belly, that will fill two people easily. Hot tip – if you plan to be drinking a lot of Hofbräu Oktoberfestbier at Brotzeit during this Oktoberfest season, make sure pick up Brotzeit’s Beer Pass ($148++) that gives you 10 x 0.5L of the beer. And if you catch the traditional Oktoberfest song “Ein Prosit” being played in-store you get to pick up the pass at only $128++ for an even better beer deal. You’re welcome. Brotzeit’s Oktoberfest celebrations run from 13 September to 23 October 2018. You can find a list of Brotzeit outlets in Singapore here.